(During winter rest) Highly prized for its compact growth, dark chocolate colour, rugose / papillate leaves. 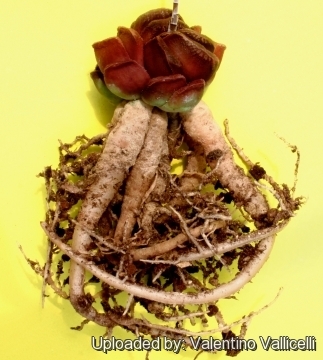 Origin and Habitat: Garden origin (Nursery produced cultivar) Japan. 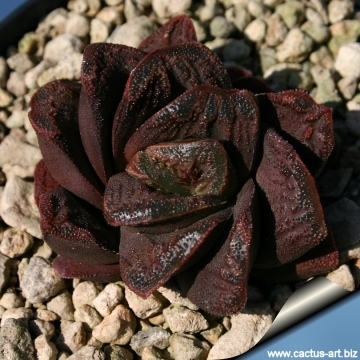 Description: Small growing (7-8 cm) this plant show a nice arrangement of dark spiralled leaves and compact growth. 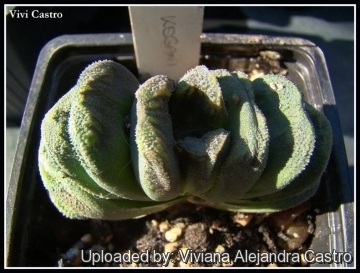 It resembles Haworthia pygmaea f. cristalina with bigger white papillae, but the leaves in young plants are distichous (arranged in two rows like a fan) This shows its clear relationship with one of its close relatives: Haworthia truncata. The leaves colour changes time by time depending on sun exposure, waterings and temperature, the best colours in winter with low night temperatures down to 0° C (or less for short periods) and with drought. 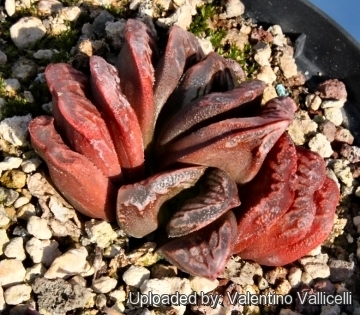 Haworthia cv. Hakuma: Japanese hybrid with small triangular rasp-like crystalline leaves with tubercles, turning pinkish to brownish-red in good light. 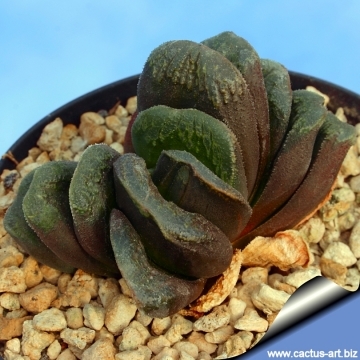 Haworthia cv. 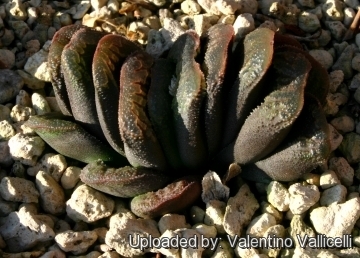 Jaffa: It comes from a cross involving Haworthia mirabilis var. 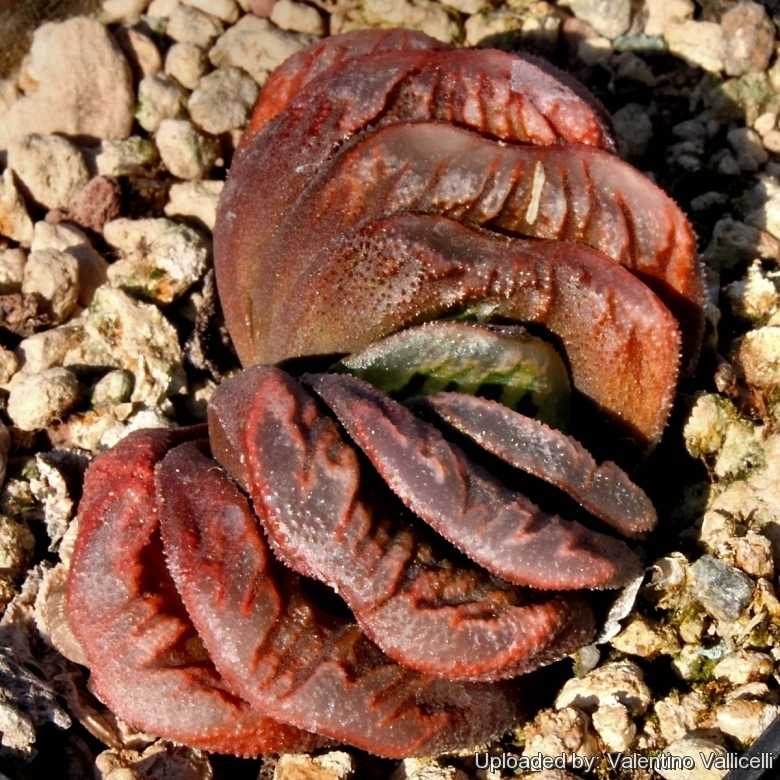 badia x Haworthia dekenahii var. argenteomaculosa. A Joyce L. Cocozza hybrid. 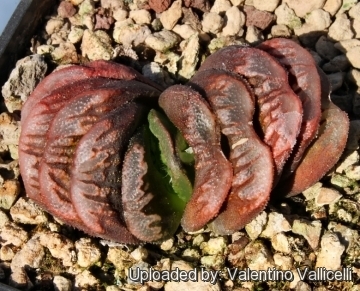 Haworthia cv. 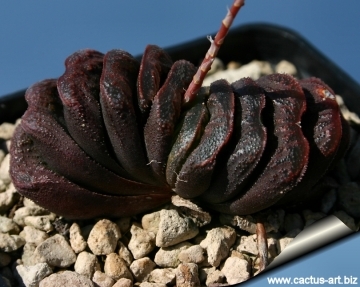 Kegani: Compact growth, with dark chocolate rugose/papillate leaves that are spirally arranged in adulhood, while in young plants they are distichous arranged (in two rows like a fan) This shows its relationship with Haworthia truncata. Cultivation and Propagation: Haworthia are of easy cultivation and relatively low maintenance, which makes them a good houseplant, and can be an excellent subject for the beginning succulentophile (they can grow easily on window sills, verandas and in miniature succulent gardens where they are happy to share their habitat with other smaller succulent plants, or in outdoor rockeries). Haworthias are winter growers and are dormant in the hottest summer months. Watering Needs: It needs regular water, but do not water again until dry. Also, it is a species that is dormant in the winter and requires very little water (maybe even none) during the cold months. Sun Exposure: Requires light shade to bright light (protect from strong midday sun). In shade the body colour will remain mostly green, while full sun will darken and give it a rich pink-red body colour. Can be sunburned if moved from shade/greenhouse into full sun too quickly. The amount of sunlight it can withstand without scorching depends upon the how hot it becomes in the summer in the location in which it is planted. It will have more colour if it receives more light. During the spring it may be able to take full sun until the heat arrives at the end of spring. In an area that has hot afternoon sun, it may be able to take full morning sun, but requires afternoon shade or afternoon light shade. Propagation: Offsets that appear at the base between the leaves; leave them attached to form a cluster, or wait until they are 1/3 the size of the parent and then detach and plant.